When you take cold drink, ice cream, hot tea/coffee & sweet then sometimes you are getting a painful experience like tooth Sensitivity?? Then know the cause & do the proper treatment. Don’t think Sensitivity is a disease, this a Symptoms of a disease. My experience as Dentist is maximum people are using Sensitivity tooth paste after seeing commercial advertisement in TV or News paper & to few are get relief from sensitivity, but they are getting temporary relief. But to get permanent relief & to protect the tooth solve the cause of sensitivity. When Tooth Sensitivity (Dentin Hypersensitivity)Happen? Tooth sensitivity usually causes When second layer of tooth structure Dentin(See Pic.1) is exposed, then it causes tooth tooth sensitivity. 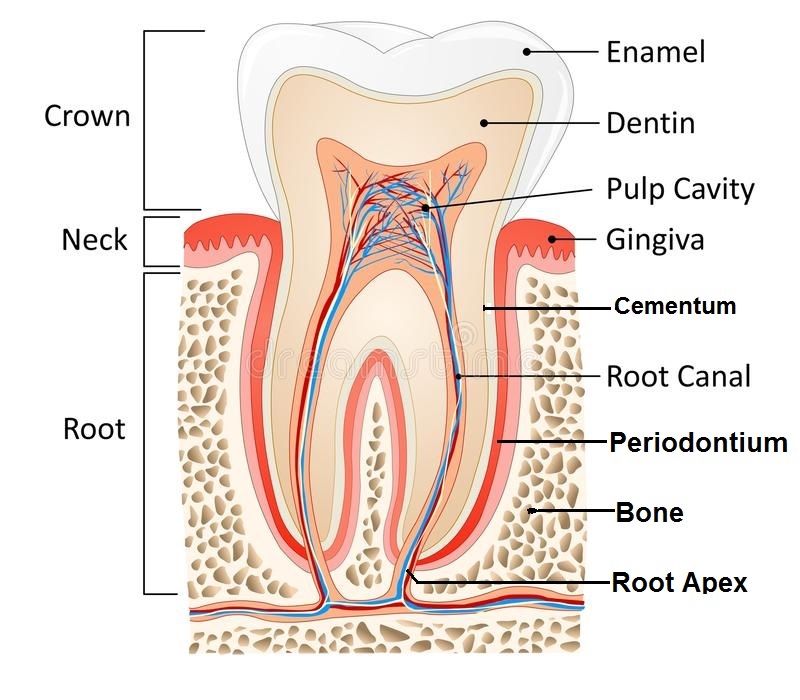 In Dentin one of the important structure in Dentinal Tubule, when it is exposed then tooth causes tooth sensitivity, later can causes dental pain. It’s so many in number. 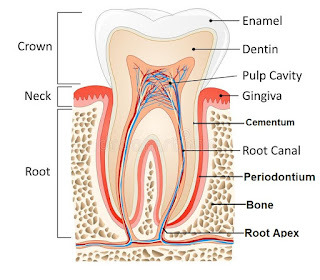 Dentinal Tubule(See Pic.2) is a tube or canal like structure which present inner to outer side direction of tooth, when it exposed then it irritate the inner structure of tooth pulp & causes tooth sensitivity. Generally when Dentinal Tubule are exposed because of loss of superficial tooth structure it causes Tooth Sensitivity. Commonly Potassium nitrate or strontium chloride used in to stop sensitivity. It is used to block the Dentinal tubule(See Pic.2) & temporary reliefs from tooth sensitivity. To know in details about tooth paste click here. Tooth Attrition, Erosion, Abrasion-Tooth Grinding, loss of tooth structure. Brush gently twice-daily with a soft/medium bristle or electric brush. don’t use hard brush. Use tooth paste. Don’t use Charcoal to clean tooth. Brush tooth proper in technique & use proper tooth paste. Rinse water after every food with sometime use Chlorhexidine mouthwash. Floss once daily & you can massage gum with your finger. Chewing habit of hard & fibrous food is a good habit, don’t take always soft or liquid food. Take balanced diet & vegetables. proper nutrition needed. Tropical Fluoride can use after advice of Dentist. If you are having malocclusion then get the treatment. For bruxism,to stop tooth grinding you can use ‘Night guard tooth appliance’. Also be sure to schedule regular dentist visits for plaque and tartar removal. Every 6 month visit Dentist for scaling treatment,for prevention of dental & general health problems. Tooth Sensitivity tooth paste closes the opening of Dentinal tubules, so impulse or irritation can’t go inside & temporarily stop the tooth Sensitivity, but it’s not cured. So, as a Dentist i will suggest you to do the proper treatment, solve the cause of sensitivity & that will be the permanent solution. If you have Caries, fracture,compromised filling or tooth attrition, erosion then treatment option is make new tooth filling Or Root canal treatment depending upon tooth condition. For gum problem Periodontal treatment is indicated. If you having this problem then visit Dentist immediately. Don’t neglect this problem. Don’t take treatment by your own, take specialist advice. If you take the correct treatment at the correct time then easily you can protect your tooth, if you getting tooth sensitivity immediately take specialist advice. So to get permanent relief & do the proper treatment, know the cause of sensitivity, treat the disease & automatically you will get relief from symptoms of tooth sensitivity.